When planning our route from the Netherlands to Slovenia, I knew we had to drive through Germany, but we only had one night, so I wanted to make it a memorable one. I googled “prettiest towns in Germany” and then chose the one closest to our route. The winner was Rothenburg ob den Tauber and what a winner it was a real fairytale town! 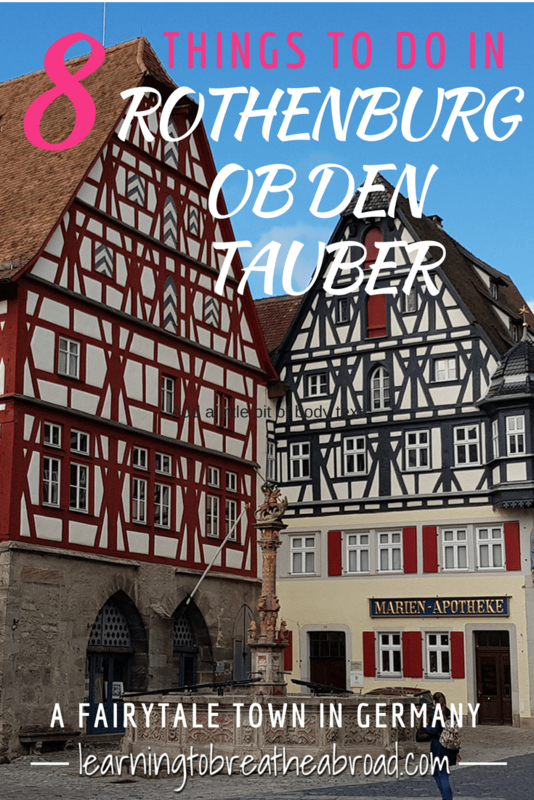 Rothenburg ob den Tauber is a medieval village dating back to the 1000 Century and you’ll certainly feel like you’ve gone back in time when wandering the streets. You can almost imagine how the city would have worked all those thousands of years ago. There was an incredibly festive atmosphere with restaurants spilling their tables and chairs onto the streets. Make no mistake, this is tourist central, but because we stayed close by, we got to be in the city after the buses had left, which meant hardly any tourists, hich was great. The buildings are all so old and picturesque – you just want to take a hundred photos! The central marketplace is a hive of activity no matter what the time of day. The town hall steps are the perfect place to have a seat, drink a beer and just soak up the atmosphere of this fairytale town. The following places of interest are all located on the town square: Rathaus (town hall), the Ratstrinkstube (Councillor’s Tavern), the Tourist Information Centre and George’s Spring. Also known as St Jacob’s Church, the St James Church is the most important church in Rothenburg and its tall steeples reach high up to the heavens, dominating the skyline of this fairytale town. The city is completely surrounded by high stone fortress walls. You will find stairs leading up to a covered walkway next to all the main gates into town. The circuitous route is 4km long and will take you right the way around the city passing the 40 different towers and gates. The walk can be done in any direction and will give you a real birdseye view of the whole town. We climbed the very steep stairwell to the top of Rauthaus (City Hall) Tower. Oh, my word was it high! And windy! I was scared my phone might blow right out of my hands while taking pics, but the view over the city was stunning. Tai is not good with heights, so made it to the top, but didn’t dare venture out. The best way to find out about the city is to do the free Night Watchman’s Tour. With his medieval cape and lantern, he’ll regale you with tall tales and amusing anecdotes. Follow him through the dark alleyways of the town as he gives you a glimpse into life in the medieval times. This museum is filled with diabolical instruments of punishment, torture and true horror. Want to know more about witch hunting and how crimes were punished back in medieval times? Make sure you have a strong stomach and take a look inside if you dare! You can’t come to Rothenburg and not have a photo at this iconic spot. The little medieval double storey house nestled in the crook of an upper and lower road is on every website, brochure and article written about Rothenburg. It is a short walk down from the main square and devastatingly, it was under repairs while I was there, so I never got to take that iconic shot. Rothenburg is famous for its Schneeballen, which are made of light pastry covered in different flavoured chocolate. I’m not sure what the fuss is about as the one we tried tasted like cardboard, but each to their own! We stayed in a parking lot (49.382120, 10.188861) with toilets and shower facilities and only one block from the city walls. It was paid parking and cost €12 for 24 hours. There were lots of other campervans when we were there. They looked more delicious than they tasted, but the big part of traveling is giving everything a try. Let me know what you thought of the schneeballen once you’ve tasted them!